F. Scott Fitzgerald’s short story, The Curious Case of Benjamin Button, finally had a chance to come to life on the big screen in 2008. Unlike Fitzgerald’s work, the film — a very loose adaptation of the short story— seems to heavily focus on the charming love narrative that develops between Benjamin and Daisy. Of course, the main element in this film is the awkward reversal of time experienced by Benjamin Button, something extraordinary to say the least, but at the same time, extremely intriguing for a movie plot. More importantly, the historical sub stories that develop throughout the movie, particularly in relation to the New Orleans area, play a large role in how Benjamin and Daisy conform and develop their relationship. 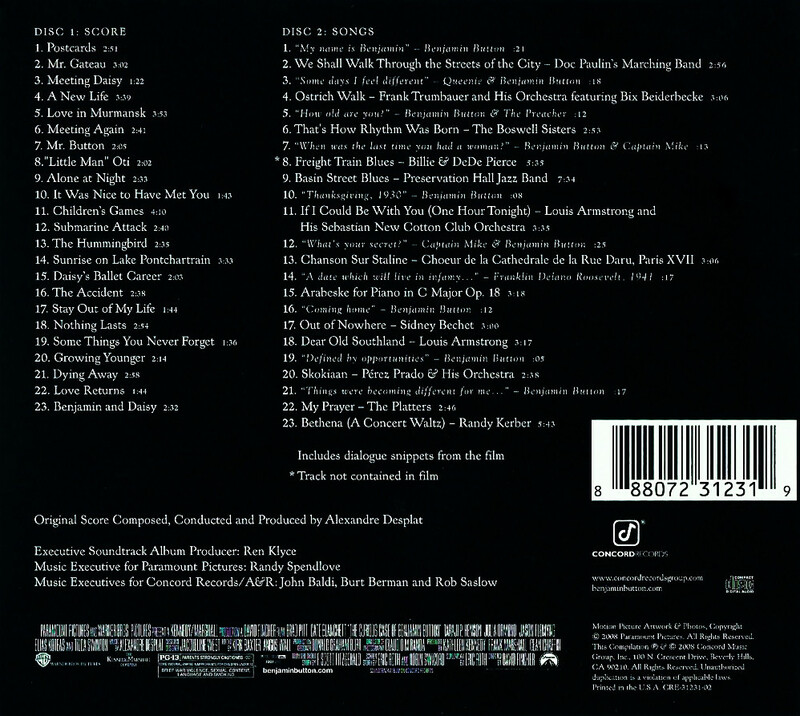 Hence, Alexander Desplat had a plethora of themes to work into his compositions. Not surprisingly, his main focus was to carefully sketch the time transformation experienced by Benjamin while cautiously incorporating a picturesque and amorous ambience. The result is a very delicate score filled with marvelous orchestrations, themes and harmonies. Ultimately, there are no exaggerated romantic or dramatic elements present in the music, allowing the score to gracefully drift through the aged and youthful characters. Postcards, a very delicate piece with poignant strings doubled by flutes, incorporates the ethereal and dreamy quality that accompanies the entire album. Transitions between sentiments of innocence, discovery and distress make themselves present across the instruments, leaving the listener captivated by the beautiful harmonies. There is a definite similarity between the piano sequence heard here and the one Alexander Desplat composed for Mr. Magorium’s Wonder Emporium. The sound slowly evolves into ‘Meeting Daisy,’ an exquisite musical representation of Daisy and Benjamin’s passion. The inevitability of capturing Daisy’s innocence in her first appearance as a little girl (majestically portrayed by Elle Fanning, I should mention) would undoubtedly be of great concern to many film composers. However, this appears to be handled incredibly well by Desplat. With an intro that parallels the qualities of a music box, pizzicato strings that bounce like children on the playground, and beautiful flute lines that accentuate the improbable understanding between the aging Benjamin and the blossoming Daisy, Desplat outshines the mise-en-scéne in David Fincher’s film. ‘A New Life,’ then, could be categorized as an expansion of the Daisy theme. In this track, Desplat integrates a beautiful violin solo, a piano, and woodwinds that help maintain a rhythmic base for the rest of the instruments. We should note that Desplat never relies on a sappy love theme to underline any of the sentimentality in the film— a true sign of understanding drama in motion pictures. ‘Love in Murmansk’ functions around a more intimate performance of a new seven note theme, aided by the previously heard motifs. Mysteriousness dominates the harmonic elements at times, but the music never stops telling the story of Benjamin. 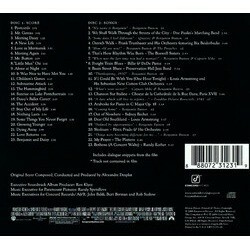 Towards the end, the main theme appears to adopt its own time-modifying capability and shifts in duration with an apparent delay achieved by the holding orchestrations. ‘Children’s Games,’ on the other hand, contains small hints of Daisy’s theme accompanied by the wonderful execution of the harps. Although still not a love theme, the notes appear to indicate a more mature persona for Benjamin and his love of Daisy. An important transition in the score’s undertone occurs in ‘Submarine attack.’ Amazingly, most of the scene involving the attack contains little or no underscore, but the music that does appear simply underlines the significance of this event for Benjamin; thus never acting as a war underscore. Here, the instrumentation appears to break away from focusing on Benjamin’s innocence. The frightening scenario for the character — and reality, to some extent — are highlighted by the pounding timpani and ghostly string effects. ‘Sunrise on Lake Pontchartrain’ also serves as a musical adjustment; this time, however, the revealing scene of Benjamin and his father’s death play a more prominent role in Desplat’s composition. Rather than being an over emotional piece, the soothing musical performance does nothing more than hypnotize the listener. Flute runs add an exceptional sentiment to the entire rhythm of the piece propelled by the beautiful string passages. Nonetheless, sadness appears to be nonexistent in the notes drawn by Desplat’s pen. ‘Daisy’s Ballet Career’ and ‘The Accident’ are two very personal pieces that center on Daisy’s life. The jazzy execution of Daisy’s theme (first heard in Meeting Daisy) shadows her successful career as a dancer. In ‘The Accident,’ a very tragic event in the film, the music enhances the events in a character-like musical sequence that seemingly goes nowhere until the very last seconds leading to the final event —the taxi running over Daisy. The final tracks of the score begin to display a slower tempo with softer, almost fading lines that suitably attach to Benjamin as he ages into infancy. ‘Growing Younger’ acts as a retrogression of Daisy’s theme. The theme appears to be slowing down while adopting a child-like quality that achieves some sense of illustrating the aging and near death of Benjamin. Furthermore, ‘Benjamin and Daisy’ showcases a very subtle and beautiful piano solo of Daisy’s theme, including many new notes that seem to vivify their entire lifetimes. There is no love theme quality to this performance either, albeit by this point in the movie the listener will intrinsically associate both in terms of a love context. The true magic of this theme reverts to the way Desplat brilliantly captured the very first scene in which Daisy approaches Benjamin in the yard: the two of them looking at each other in a truly innocent yet passionate way. The words beautiful, mysterious, charming, ethereal, among others, fall short of describing the primary emotion conveyed in Desplat’s score. The sense of innocence, passion, and maturity, all come together, forming an even deeper feeling that proves hard to describe with words. Benjamin and Daisy’s love theme expresses a new kind of affection that develops during an aging childhood, ultimately achieving a new level of scoring and dramatic understanding. Perhaps only Bernard Herrmann was able to achieve the aforementioned with his love theme for Vertigo. 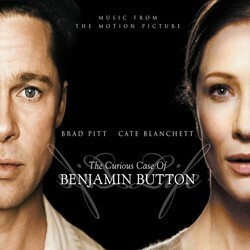 Desplat exceeds all expectations with his score for The Curious Case of Benjamin Button. Unfortunately, the Academy of Motion Pictures Arts and Sciences failed to reward one of the most majestic scores of the last decade, deciding to give the Oscar to A.R Rahman. Surely The Curious Case of Benjamin Button score lacks the action packed, fast paced music most moviegoers enjoy; but even when functioning in a slow, gentle tempo, Desplat’s score exhibits harmonies and orchestrations that are rarely seen in Hollywood. This is undoubtedly an outstanding work by Alexander Desplat that deserved greater recognition and an Oscar for best score of 2008. The Curious Case of Benjamin Button is taken from a short story by F Scott Fitzgerald and tells of a man who is born old (albeit a baby with old age thrust upon it) and gets more youthful, eventually reverting back to a proper baby. The film diverges significantly from the book and stands more of a film inspired by the book, but that's certainly not a complain. It's a delightful, albeit somewhat sobering, film (and not nearly as much like Forrest Gump as some people have claimed - they are both fictional life stories, that's more or less it) and Brad Pitt shows he's not only immensely hot, but also an actor of range, even if his performance as an old, young man is effects enhanced. David Fincher is not the director one would guess having seen the film, but the music is unmistakably the work of Alexandre Desplat and few composers in 2009 would be better suited, Thomas Newman being the only serious rival. In fact, Desplat's lightness of touch and delicate orchestrations aren't a million miles from Newman, even if one would never confuse the two, notably because Desplat's themes appear more than once or twice. As befits Desplat's style, there is no big sweeping theme, but a gently lilting waltz that is presented in numerous guises throughout, perhaps most engagingly for Love in Murmansk where a cimbalon makes a slightly unexpected, but welcome addition to the palette. It's an interesting tone that Desplat maintains; Love in Murmansk is clearly slightly romantic, but he hints at the emotions rather than stating them outright. Elsewhere there's melancholy, snippets of humour (Mr Gateau and Little Man Oti) and even some more lively passages such as Mr Button and the tense Submarine Attack (a sequence in the film that never seems to be quite as visceral as one expects it to be, despite seeming so expertly staged and filmed). The Accident is another beautifully judged cue, building in a way that you don't realise its building until it abruptly concludes. Of course, Desplat doesn't do anything so vulgar as action music in a film such as this and his ability to conjure momentum and excitement with the minimum of fuss is typically impressive. As could be said for the film itself, the album seems to run a little long. Thematically, it's a little repetitive (when you have near enough three hours of film and an hour of music, the score can afford to be more repetitive than wall to wall music for 90 minutes) and doesn't jump around tonally a great deal. Having said that, as with the film, Desplat's music is beautifully understated and the thematic material is very strong (as usual) and the cues themselves are still varied in the way the major melodies are treated. For those who like their love and loss in broad strokes, Benjamin Button may be slightly underwhelming and it certainly isn't a score to dazzle the listener. Again, if you want tunes to sob to, stick to Silvestri's Forrest Gump (different, but equally fine in its own way) However, it's hard not to be drawn into Desplat's beautifully etched musical portrait.